Please register for this FREE online summit, taking place from September 30th through October 10th, that will bring together the leading authorities and latest information on creating Trauma-Sensitive Schools. As a parent, teacher, school administrator or child welfare professional, you know that a child’s early trauma can have significant impact on his/her ability to learn in a typical classroom. And the behaviors and struggles of traumatized children are often overwhelming. What can we do? 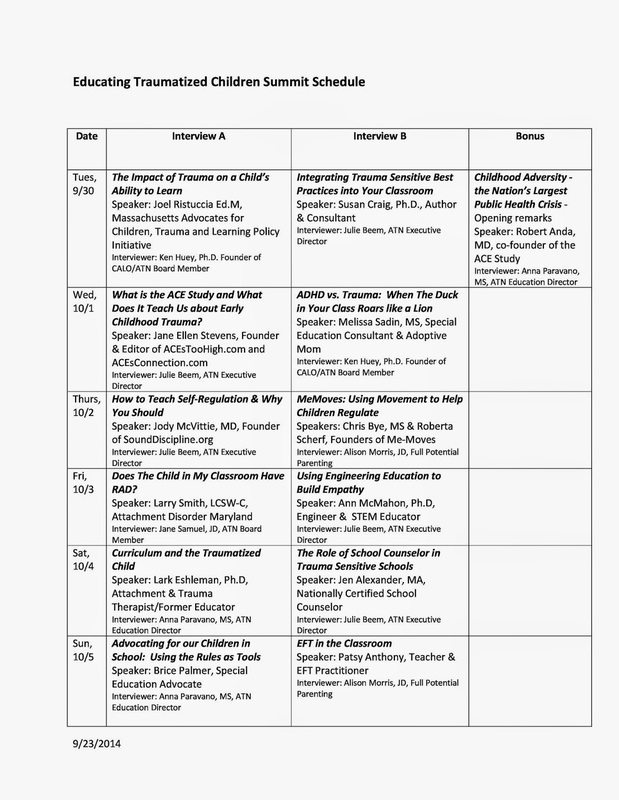 ATN is presenting 22 audio interviews during our 10-day summit that will explore these topics and give examples of some very exciting programs and strategies being implemented across the United States. Listen in for FREE or buy the entire summit as audio recordings (mp3) and/or as transcripts. Is it ADHD or Trauma? VERY IMPORTANT: Please watch for and respond to the confirmation email you will receive after registering! If you do not respond to the confirmation email, you will not be registered. International (Outside the US) Participants: If selecting “not applicable” for State does not work during registration, select “Alabama” (the first state on the list), then select your Country and your registration should go through. Buy recordings and transcripts HERE.